A vertex is the common initial point, where two line segments or rays join or meet forming an angle. An angle is also formed when two rays moving in different directions have a same initial point. 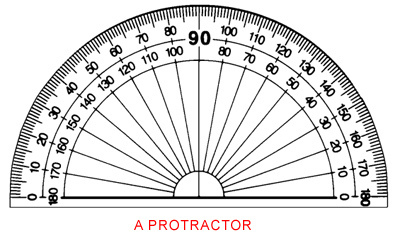 A protractor is used to measure an angle. The unit of measurement is degree.Â There are different types of angle like acute angle, obtuse angle, straight angle, right angle and reflex angle. The interior points or the parts that lie inside the angle are called interior angles and the part or the point that lies outside the angle is called exterior angle. The amount of rotation through which one arm must be rotated around the vertex to bring it to the position of the other arm is called the magnitude of an angle. There are actually 360 degrees in a circle. A straight angle is more like half a circle. It is formed when two rays starting from a same initial point travels and settles in a perfectly opposite direction. The measurement of a straight angle is 180 degree. The most common form of an angle is the right angle. The best examples for a right angle can be the edges of your notebook paper, the edges of picture frames, stair steps. The measurement of a right angle is exactly 90 degrees, which is exactly the half of a straight angle. An angle, which measures more than 0 degree but less than 90 degrees, is called an acute angle. Therefore, an acute angle is always lesser than right angle and straight angle. 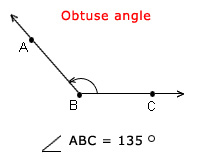 An angle, which measures more than 90 degree but less than 180 degrees is called an obtuse angle. Therefore, an obtuse angle is always greater than a right angle but less than a straight angle. An angle, which measures exactly 360 degrees, is called a complete angle. When two angles measure the same, they are called congruent angles. 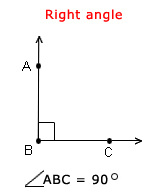 Suppose angle X and Y measures exactly the same then you can say that angle X is congruent to angle Y. 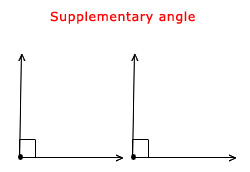 When the values of two angles add up to 180 degrees they are called supplementary angles. In this case, both the angles measure 90 degrees each so they sum up to 180 degrees. Supplementary angles need not touch each other or have to be in the same plane. The only criteria they need to fulfill is that the addition of their values should give 180 degrees. Two angles are said to be complementary if the summation of their value gives 90 degrees. In this case, there are two angles, Angle X Â measuring 30 degrees and the Angle Y measuring 60 degrees, so they add up to 90 degrees. 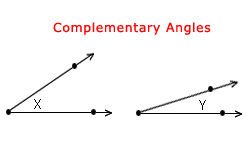 Therefore, we can say these angles are complementary angles as adding their value will give 90 degrees. 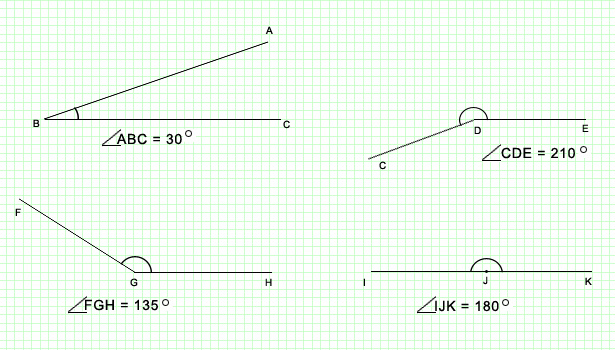 If you feel you have a good understanding, move on to our Classifying Angles Test.